The new Android 2.1 OS based Motorola smartphone “Flipout” will soon be out in India, most probably by first week of November. 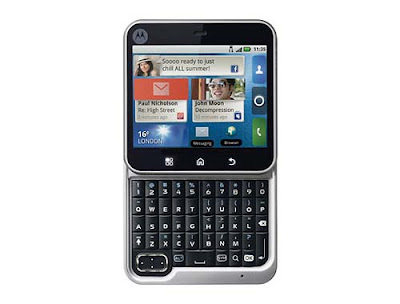 The device will also incorporate Motorola's Motoblur for handling User Interface work.Motorola Flipout is a flip phone as suggested by its name and thus boasts of a slide (also called as a flip). This function reveals the full five row QWERTY keypad when used. There are a set of cool features in this unusual smartphone which was revealed sometime back in Singapore. It will soon be launched in other Asian countries including India. November first week is the festive time here and it will be co-incide with launch of Motorola Flipout and many more mobile handsets. In fact, pre-orders are already being taken for the phone. The Motorola's Flipout has a 2.8 inch wide display with 320X420 pixels resolution and the handset runs at a super speed with its 700 MHz processor which has multi-touch screen with pinch-to-zoom feature. The homescreen of Motorola Flipout features customizable widget support and this is for all the social networking sites viz. Facebook, MySpace and Twitter. 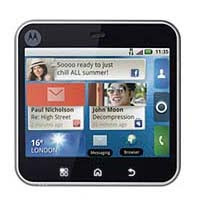 Motorola FLIPOUT is also a 3G phone supported on HSDPA 900 / 2100 network. There is 3.1 megapixel camera and allow its users to upload clicked pictures and made videos instantly on Facebook, MySpace, Picasa and Photobucket.The internal memory of 512MB ROM / 256MB RAM is also incorporated in the phone.The internal memory can be expanded to 32GB via a microSD card. It gives access to Google services viz. Google Search, Gmail, Google Maps etc. plus access to many apps on Android Market. Phone supports A-GPS (assisted) and e-compass for easy navigation purpose. There is a 3.5mm headset jack, FM Radio, AAC, AAC , AAC Enhanced, AMR NB, MP3 and WMA v9 file format support. For connectivity, there is USB 2.0 HS and Wi-Fi, For messaging, there is MMS, SMS, Email (Corporate Sync, POP3, IMAP, Push Email) and Instant Messaging. With physical dimensions of 67.00 x 67.00 x 17.00 mm and weight just 120 grams, Motorola FLIPOUT will be available in White, Fairway Green, Poppy Red, Raspberry Crush, Brilliant Blue, Licorice and Saffron colors. Priced at Rs.15,299, phone best price may differ slightly. 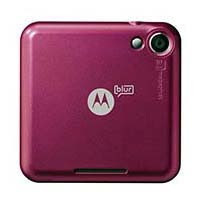 Motorola Charm may also launch with Flipout, but nothing is certain.